Work continues on an apartment conversion at 1038 N. Ashland Ave.
West Town residents come here to learn about the East Village Association, read its Planning, Preservation & Development guidelines, check the Chicago crime map or renew their membership. Restaurant plan shakes Damen neighbors: Plans for a burger bar at 820 N. Damen Ave., now an auto mechanic's garage, have not progressed since an August hearing. Ald. Brian Hopkins (2nd Ward) proposed and the City Council approved a moratorium on new tavern and packaged-goods licenses along Damen Avenue, from Chicago Avenue to Augusta Boulevard. Restaurants are not affected. The license freeze also covers Chicago Avenue from Leavitt Street to Damen. 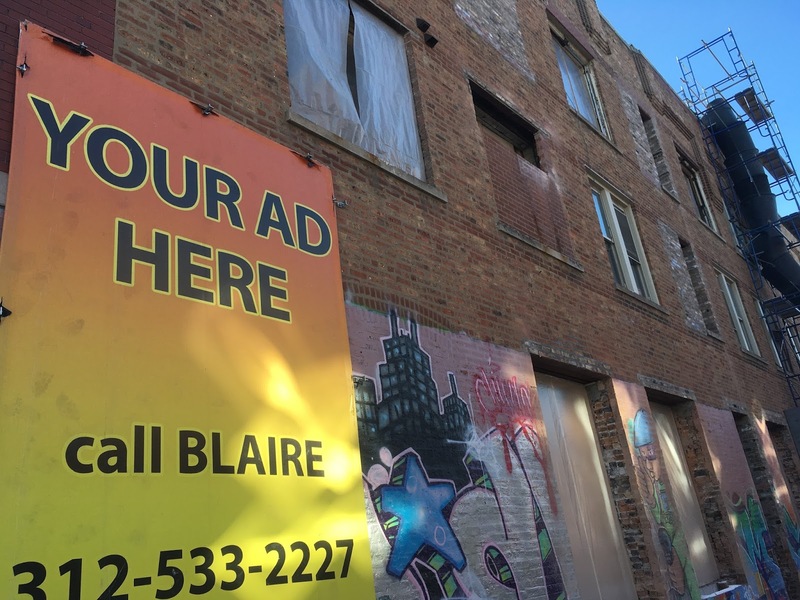 Foxtrot Market scouts Division Street site, seeks end to packaged goods moratorium: Division Street's longstanding package-goods moratorium ended in a City Council action sponsored by Ald. Proco Joe Moreno (1st Ward). The Foxtrot delivery service now plans to open a store at 1722 W. Division St.
Apartments will rehab Ashland office building: Work is under way to covert the MIS Computer Corp. office building at 1038 N. Ashland Ave. to 18 apartments and a property management office. EVA joins in Noble-Walton objections: Plans have re-emerged for apartments on the north side of Walton Street. A community meeting is scheduled for 6pm Jan. 3 at Northwestern Settlement House, 1012 N. Noble St.
EVA seeks Moreno support for Wells language academy: Chicago Public Schools rejected a plan for a citywide college preparatory program in foreign languages at Wells Community Academy High School, 936 N. Ashland Ave. Dial down single-family upzoning: EVA board: A property at 1538 W. Thomas St. was sold in December, according to multiple-listing records.In November, the city changed its zoning to RM-4.5. The EVA board had opposed a more aggressive upzone. East Village Association officers 2017-2018: EVA officers change every April, but 2017 saw midterm replacements for Peter Gariepy as treasurer and Daniel Navarro as secretary. Parents' bid for Wells language academy gets EVA support: Former Wells High School principal Rita Raichoudhuri now heads Chicago schools' guidance and special academic programs. Public safety: Let your voice be heard on crime Thursday: Hopkins circulated petitions at yearend aimed at reopening the former 13th District station at 937 N. Wood St. Hopkins and Moreno signed EVA's pledge to work toward returning a Chicago police presence there by September 2018. Ben Wolf, candidate for Congress, speaks to EVA: Incumbent Rep. Mike Quigley was July's featured speaker; other candidate visits and a planned meet-and greet event will precede the March 20 primary.